Did you watch Meteor, the 2-part miniseries on NBC? It was soooo bad, I was rooting for the Meteor! Bad script, bad acting and more cliches than the FCC should allow in a 4-hour span. Christopher Llyod had the best part and he was killed off in the first 20 minutes. Of course, my computer was on. 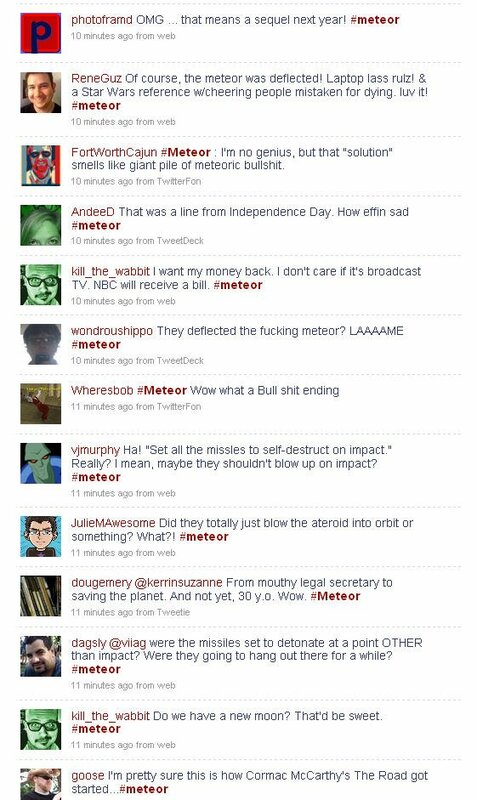 Just for fun, I decided to search for #meteor on Twitter. Turns out a lot of people had the same idea. Not since Mystery Science Theater 3000, did watching a bad movie turn into such a good time! Don’t just roll your eyes, TWEET! NBC is promising another stellar movie next week with The Storm. Be sure to log into Twitter next week and search for #thestorm to join in!